How to Get (Partial) Eta Squared from SPSS? You are here: Home ANOVA SPSS ANOVA FAQ How to Get (Partial) Eta Squared from SPSS? We report these 3 numbers for each effect -possibly just one for one-way ANOVA. Now, p (“Sig.” in SPSS) tells us the likelihood of some effect being zero in our population. A zero effect means that all means are exactly equal for some factor such as gender or experimental group. However, some effect just being not zero isn't too interesting, is it? What we really want to know is: how strong is the effect? We can't conclude that p = 0.05 indicates a stronger effect than p = 0.10 because both are affected by sample sizes and other factors. So how can we quantify how strong effects are for comparing them within or across analyses? Well, there's several measures of effect size that tell us just that. One that's often used is (partial) eta squared, denoted as η2 (η is the Greek letter eta). Partial Eta Squared - What Is It? where SS is short for “sums of squares”, the amount of dispersion in our dependent variable. This means that partial η2 is the variance attributable to an effect divided by the variance that could have been attributable to this effect. 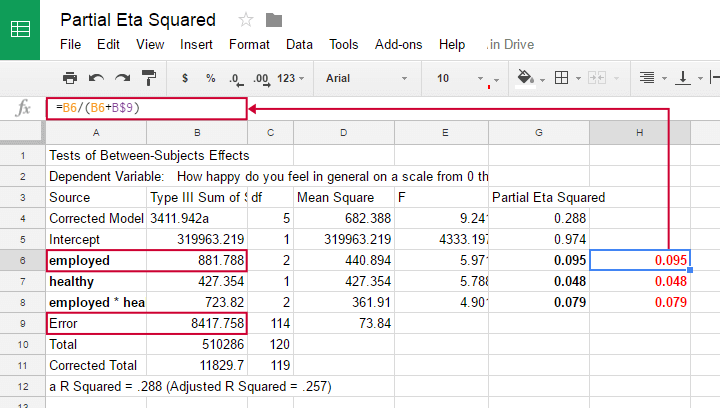 We can easily verify this -and many more calculations- by copy-pasting SPSS’ ANOVA output into this GoogleSheet as shown below. which is equal to (non partial) η2. Let's now go and get (partial) η2 from SPSS. A scientist asked 120 people to rate their own happiness on a 100 point scale. Some other questions were employment status, marital status and health. The data thus collected are in happy.sav, part of which is shown below. We're especially interested in the effect of employment on happiness: (how) are they associated and does the association depend on health or marital status too? Let's first just examine employment with a one-way ANOVA. 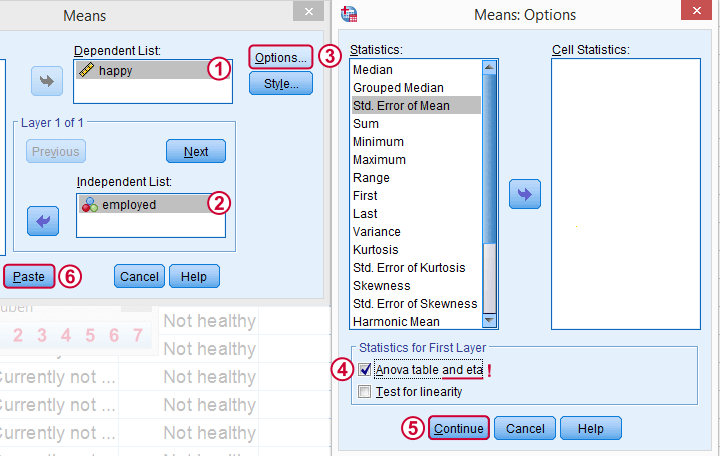 SPSS offers several options for running a one-way ANOVA and many students start off with Analyze Compare Means One-Way ANOVA but -oddly- η2 is completely absent from this dialog. We'll therefore use MEANS instead as shown below. Clicking Paste results in the syntax below. Since it's way longer than necessary, I prefer just typing a short version that yields identical results. Let's run it. *Means command as pasted from menu. *Short version (creates identical output). And there we have it: η2 = 0.166: some 17% of all variance in happiness is attributable to employment status. I'd say it's not an awful lot but certainly not negligible. Note that SPSS mentions “Measures of Association” rather than “effect size”. It could be argued that these are interchangeable but it's somewhat inconsistent anyway. 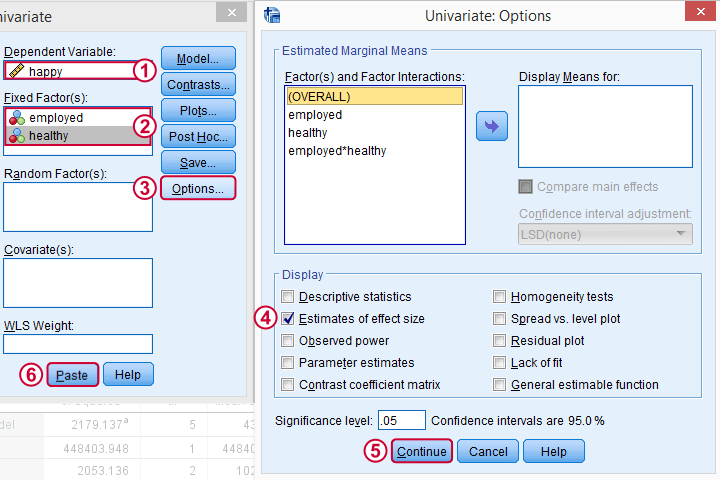 Perhaps the best way to run ANOVA in SPSS is from the univariate GLM dialog. The screenshots below guide you through. This results in the syntax shown below. Let's run it, see what happens. *One-way ANOVA with eta squared as pasted from Analyze - General Linear Model - Univariate. We find partial η2 = 0.166. It was previously denoted as just η2 but these are identical for one-way ANOVA as already discussed. For multiway ANOVA -involving more than 1 factor- we can get partial η2 from GLM univariate as shown below. As shown below, we now just add multiple independent variables (“fixed factors”). We then tick Estimates of effect size under Options and we're good to go. *Two-way ANOVA with partial eta squared. Pasted from Analyze - General Linear Model - Univariate. First off, both main effects (employment and health) and the interaction between them are statistically significant. The effect of employment (η2 = .095) is twice as strong as health (η2 = 0.048). And so on. Note that you couldn't possibly conclude this from their p-values (p = 0.003 for employment and p = 0.018 for health). Although the effects are highly statistically significant, the effect sizes are moderate. We typically see this pattern with larger sample sizes. Last, we shouldn't really interpret our main effects because the interaction effect is statistically significant: F(2,114) = 4.9, p = 0.009. As explained in SPSS Two Way ANOVA - Basics Tutorial, we'd better inspect simple effects instead of main effects. We can get (partial) η2 for both one-way and multiway ANOVA from Analyze General Linear Model Univariate but it's restricted to one dependent variable at the time. Generally, I'd say this is the way to go for any ANOVA because it's the only option that gets us all the output we generally need -including post hoc tests and Levene's test. We can run multiple one-way ANOVAs with η2 in one go with Analyze Compare Means Means but it lacks important options such as post hoc tests and Levene's test. 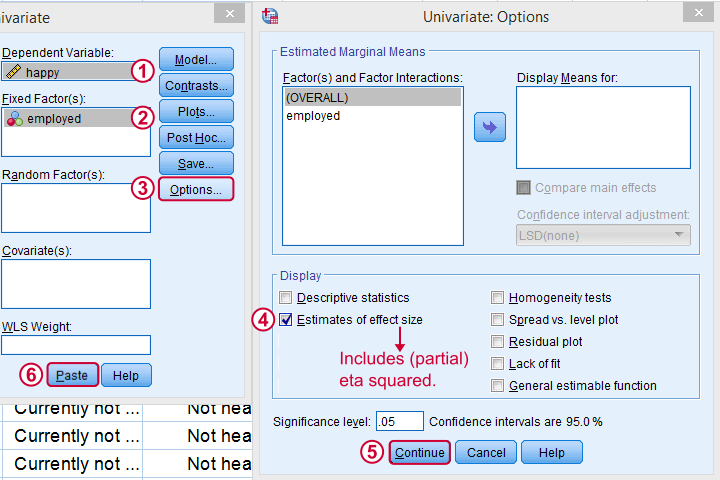 These -but not η2 - are available from the One-Way ANOVA dialog. This renders both options rather inconvenient unless you need a very basic analysis. I hope you found this tutorial helpful. Thanks for reading! Previous tutorial: How to Run Levene’s Test in SPSS? Next tutorial: Variance – What Is It? to stay in line with r square. By having a common denominator, the effect sizes are comparable. But more importantly, the total model r-square is taken into account. Btw, there's also Omega squared for ANOVA. But I can't look that up right now, I'm on holiday and I (obviously) didn't bring any books.